DecoTherm is fast, easy and affordable. It is made with a ceramic frit technique to create permanent and highly detailed images. 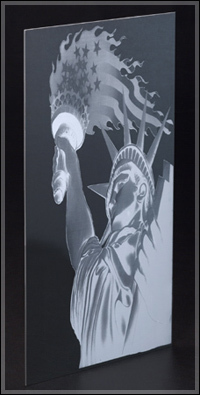 Unlike traditional sandblasting techniques, DecoTherm resists fingerprinting and is easily cleaned. DecoTherm can be used commercially and residentially . It can be used to transform walls, windows, doors, kitchen cabinets, shower doors, and partitions. Literally any design can be used so the possibilities are endless. You can choose from hundreds of stock designs or create your own. It is available in the 7 colors listed. SGO Designer Glass is proud of its reputations as a "problem solving" company. We are always seeking to extend the boundaries of glass and design. Working together with DecoTherm, our artistic teams can get you exactly what you want. Whether that is combining stock designs, or creating a new one from scratch. The SGO Designer Glass experience begins in either our studio, your home or your business. During this step we try to gather as much information about your project and needs. We will sit down with you to look at numerous samples with different colors, gradations and thicknesses, as well as discus all of your installation options. If you are unsure of what it is you'd like to do, not to worry, we can help. Our design consultants have numerous tools and templates and are ready to assist you in developing your ideas.